Beer Fellows: It's pumpkin time! An intro and a review. We have reached that time of the year where finally the temperature appears to be cooling down. Autumn is here not only date wise but weather-wise also. That means it is time for an all around original American style brew, pumpkin ale. The first recorded recipe of pumpkin ale dates from 1771, but with beer being such a big part of colonial life it is easy to argue that resourceful colonists had being brewing with this plentiful fall fruit many decades earlier. Pumpkin ales today take more of their influence from pumpkin pie than just the fruit itself, using a variety of spices found in the dessert to inform the brew. No worries though, the pumpkin itself is still the leading actor. 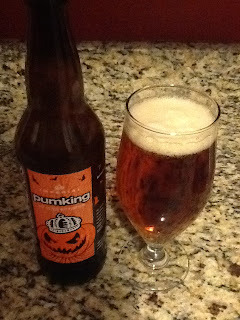 Pumpkin ales vary quite a bit, the only real constant is the pumpkin itself, but even how or when it is applied to the brew kettle can be different from brewer to brewer. Our first on the docket is Pumking by Southern Tier Brewing. This is a beer I have been wanting to try now for a few years and now I finally get the chance. Let's dive in. For starters, the aroma of this beer is fantastic especially if you love pumpkin pie. On the first whiff it smells like the dessert and that aroma stays with the ale through the entire glass. It is very pleasing. In appearance this beer has a clear orange, copper color with small, quickly disappearing light tan head. On the drink it starts off smooth but quickly balloons into a big bundle of spice and flavors in the mouth. It has a light sweetness that eventually gives way to a dry, mildly bitter finish. This beer is a good study on putting all the pieces together, it has the right aroma, the right look, and the right appearance. All these add up to a unified and enjoyable drinking session. That said, this is a one bottle beer. It is big, complex, and tasty, but I wouldn't want to drink multiples of this in row. First it comes in at a very deceptive 8.6% ABV. All the spice and flavors mask the alcohol very well but it does pack a bit of a punch. Second, it is a bit of a spice bomb and after awhile all those flavors start becoming a bit of a drag. Break out a bottle or two of these for a fall dinner party and use it as an aperitif in four ounce tasters and you have yourself a sure fire winner. One recommendation, I enjoyed this beer more as it warmed up and more character developed. All Hallows Eve is a time of the year when spirits can make contact with the physical world, and when magic is most potent. It is thought that we harness this magic to brew our powerful pumpkin ale. Not so, but it is with great respect of the magic of their trade that our brewers produce this fine beer. Take a whiff of this complex ale and your journey has just begun. At first sip, a magical spell will bewitch your taste buds, yet another victim enraptured by the Pumking.